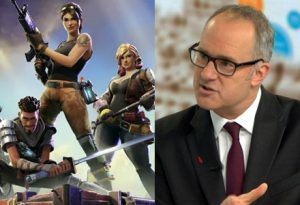 The Civilian – Just how much of the $2 billion Kiwibuild fund has Phil Twyford spent on Fortnite? Just how much of the $2 billion Kiwibuild fund has Phil Twyford spent on Fortnite? On the left is one thing we’re talking about. On the right is another thing we’re talking about. You see them here juxtaposed. You are now informed. One Auckland mother is reportedly furious and distraught after finding her finances several million dollars short due to purchases in the video game Fortnite by one of her ministers. The minister, 55-year-old Phil, has reportedly racked up untold numbers of cosmetic purchases on the mother’s account without her knowledge, and the wider family has been left to pick up the pieces. The popular new game has proved dangerous to children all over the globe, entrapping them with the use of fun and a distraction from the increasingly undeniable pointlessness of existence. The game has become popular enough that it has forced media to cover it, causing headaches for journalists who are young enough to know plenty about video games but with an old enough audience they still have to write like they’re imbeciles. The game has apparently captured the imagination of Housing Minister Phil Twyford, who has allegedly spent “millions” of the $2 billion fund on the video game. But privately, Prime Minister Jacinda Ardern and Finance Minister Grant Robertson are fuming, and a loud argument took place on Wednesday in Twyford’s bedroom, which he has refused to come out of since. “What are these?” growled Ardern, waving a series of bank statements. To meet his targets, Twyford needs to complete 1,000 houses by July 1st next year, 150 of which were meant to be built in Minecraft. “One is made of dirt,” he added. He was also quick to point out that you can “build stuff” in Fortnite too, though he wasn’t sure whether weaponised fortresses counted towards the targets. The Government has been in contact with Epic Games, the makers of Fortnite, to try and seek a refund on Twyford’s purchases, but a spokesperson for the company said it was “up to parents” to police the spending habits of their 55-year-old housing ministers.